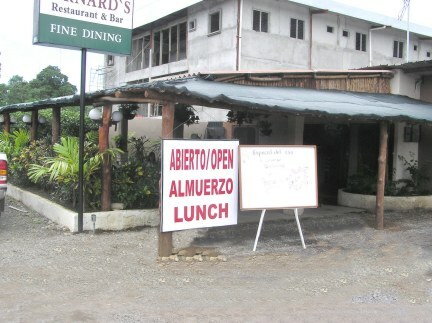 Bernard Bahary runs a great restaurant at David’s international airport. But he had a problem, when the airport shut down each evening – so did his restaurant. His solution was simple – find another place to serve his growing clientele in the evenings. Just over a month ago he opened David’s second Bernard’s restaurant. Many of his loyal clients are preferring his new and more convenient location. I am happy to report that his food is getting even better. If you come into David from the Pan-American Highway and head for the central Romero supermarket, hang a right and a few blocks down on the right you will see his sign. He has a well decorated covered patio and still has a great selection of music – classic hits from the 50’s. And bless his little cotton socks he does not have that hideous staple of most bars and restaurants, that annoying, blaring television. One thing Bernard does better than any one else in David is that he has the courage to spice up his food. His logo should be “Say goodbye to bland and boring.” If you are a food wimp that is terrified of something as simple as a pepper pot, then there are many eateries that will happy send your taste buds to the land of bland and boredom. Bernard attempts to educate the palate, don’t worry he will be gentle if it’s your first time. My wife had one of Bernard’s special pizzas the other day that woke up her mouth with a “wow.” I ordered a curry wrap that was a meal in itself. Another great feature at Bernard’s is the portions are always generous. The wrap was part of a $6.00 lunch special that included a slice of cheesecake for desert. 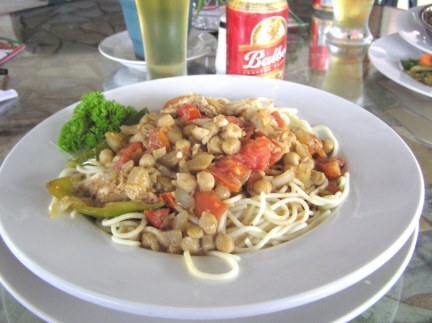 Washed back with a cool glass of Panama’s best beer –Balboa - it was a meal to remember. The menu is international with items from Thailand, India, Greece and the Mediterranean. 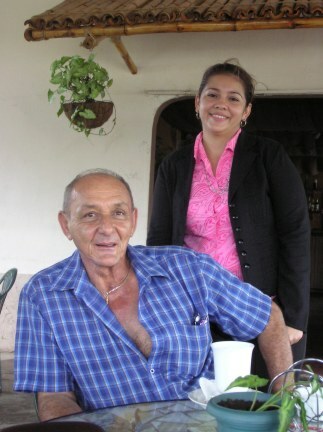 Bernard is fortunate to have as an assistant chef, 30-year old local Davidian Guillermina Vergara. Guillermina commutes between downtown and the airport, I have seen her at both locations and her commitment to quality at either place is obvious. 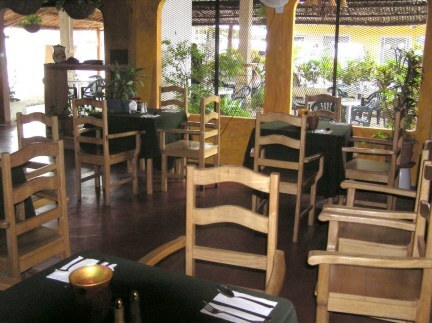 Bernard originally came from Tehran in Iran and ran a successful restaurant in Bocas Del Toro. Ill health forced him to move closer to medical care. His enthusiasm for creating new and flavorful dishes is obvious. Traditionally chef’s of this caliber are French or Italian, but Iran is famous for being the location of some of the worlds greatest archealogical sites. Perhaps his genius is genetic inheritance from thousands of years of experimenting with exotic spices. The prices should be within any VISITORS budget, with Sancocho soup starting at $3.50. Wraps starting at $6.00 and the most expensive item being fillet mignon at $10.00. Local beer is just $1.00 a bottle. For those of the Italian culinary persuasion, Bernard also features 14 variations of either pasta or pizza. Bernard’s in the city is open from 11.00 in the morning until 10:30 at night. He is closed on Sunday and Monday. If you need directions or would like to make reservations in his 48 seat restaurant, call (507)6751-5028.